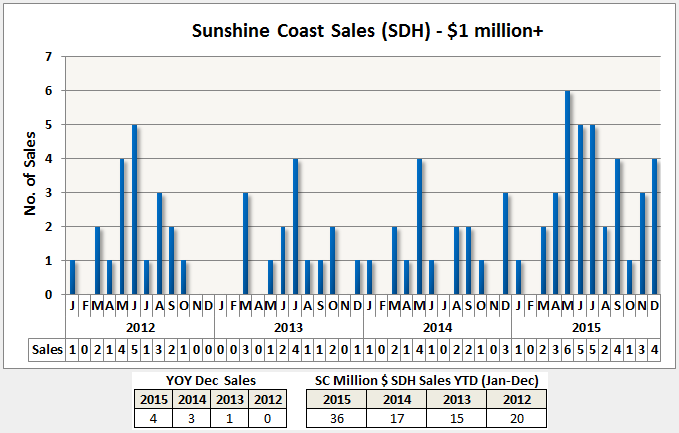 If you needed one definite indicator that the Sunshine Coast real estate market had turned around in 2015, then this is it – million dollar plus property sales. The 4 sales in December brought the year’s total to 36 – an impressive +118% improvement over 2014's 17 sales and an increase of +150% over 2013’s paltry 15 sales. Gibsons and Halfmoon Bay led all SC market areas with 10 ‘$1mill+’ property sales apiece. 6 of those sales in Gibsons were waterfront whereas in HMB they were all waterfront. Sechelt came in next with 8 sales – 7 of those waterfront and Roberts Creek and Pender Harbour tied for 4th spot with 4 sales apiece: 3 of those in RC were waterfront and all 4 were waterfront in PH. Now, if those 2015 big ticket sales made you smile, you won’t be able to wipe the grin off with 2016’s numbers – yep, your face is going to hurt. Stay tuned.